Noreen Billet aluminum AR-15 Lower Receivers are ready for your next build. The Anderson Manufacturing "Closed Ear" Stripped Lower Receiver is a fully Mil-Spec, semi-auto lower ideal for your next custom build! Manufactured from high-strength 7075-T6 forged aluminum and MIL-STD hard coat anodized for extra strength and durability. Precision machining ensures drop-in installation of all mil-spec components! Marked Multi-Cal. Aero Precision's Gen 2 Stripped AR-15 Lower Receiver is the perfect base for your custom rifle build. Machined to mil-spec dimensions, these lowers work with standard AR15 components and ensure the highest quality with a correct component interface. Improvements in the Gen 2s include an upper tension screw for fine-tuned upper / lower fit no matter who's receiver you match with your Aero Lower, and an increased magwell flare for easier magazine insertion and a more sleek look! The “Don’t Tread On Me” AM-15 Stripped Lower Receiver is American made with superior quality for less! Our lower Receivers are CNC machined from a high-strength, 7075 T6 aluminum forging for reliable performance and outstanding durability. Machined to Military Specifications & Standards with an open trigger and marked “Multi-Cal” to be used with multiple calibers on the AR-15 platform. 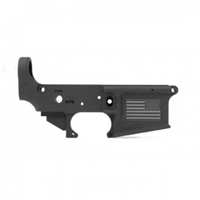 This Lower Receiver comes in type III black hard anodize. The “Molon Labe” AM-15 Stripped Lower Receiver is American made with superior quality for less! Our lower Receivers are CNC machined from a high-strength, 7075 T6 aluminum forging for reliable performance and outstanding durability. Machined to Military Specifications & Standards with an open trigger and marked “Multi-Cal” to be used with multiple calibers on the AR-15 platform. This Lower Receiver comes in type III black hard anodize. The “Punisher” AM-15 Stripped Lower Receiver is American made with superior quality for less! Our lower Receivers are CNC machined from a high-strength, 7075 T6 aluminum forging for reliable performance and outstanding durability. Machined to Military Specifications & Standards with an open trigger and marked “Multi-Cal” to be used with multiple calibers on the AR-15 platform. This Lower Receiver comes in type III black hard anodize. The “This We’ll Defend” AM-15 Stripped Lower Receiver is American made with superior quality for less! Our lower Receivers are CNC machined from a high-strength, 7075 T6 aluminum forging for reliable performance and outstanding durability. Machined to Military Specifications & Standards with an open trigger and marked “Multi-Cal” to be used with multiple calibers on the AR-15 platform. 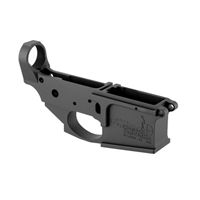 This Lower Receiver comes in type III black hard anodize. These lower receivers are machined to our specifications and are the perfect base for your custom rifle build. Machined to mil-spec dimensions, these lowers work with standard AR15 components and ensure the highest quality.This lower includes an upper tension screw for fine-tuned upper/lower fit no matter who's receiver you match with your lower. The Spike's Tactical Spider Lower is the standard lower that all ST-15 LE Rifles are assembled with, featuring the Spikes Spider Logo placed prominently on the left side of the magwell. The selector markings are bullet pictograms. Manufactured from high-strength 7075-T6 forged aluminum and MIL-STD hard coat anodized for extra strength and durability. Precision machining ensures drop-in installation of all mil-spec components! Marked Multi-Cal. The Spike's Tactical Spider Lower is the standard lower that all ST-15 LE Rifles are assembled with, featuring the Punisher Lower is a special series lower featuring a Punisher logo instead of the usual ST Spider logo. The selector markings are Bullet Pictogram. Manufactured from high-strength 7075-T6 forged aluminum and MIL-STD hard coat anodized for extra strength and durability. Precision machining ensures drop-in installation of all mil-spec components! Marked Multi-Cal. The Spike's Tactical Spartan Lower is a special series lower featuring a Spartan Helmet logo instead of the usual ST Spider logo. Now features unique selector markings! Manufactured from high-strength 7075-T6 forged aluminum and MIL-STD hard coat anodized for extra strength and durability. Precision machining ensures drop-in installation of all mil-spec components! Marked Multi-Cal. The Spike's Tactical Calico Jack Lower is a special series lower featuring a Calico Jack t logo instead of the usual ST Spider logo. Now features unique selector markings! Manufactured from high-strength 7075-T6 forged aluminum and MIL-STD hard coat anodized for extra strength and durability. Precision machining ensures drop-in installation of all mil-spec components! Marked Multi-Cal. The Spike's Tactical Honey Badger Lower is a special series lower featuring a Honey Badger logo instead of the usual ST Spider logo. Now features unique selector markings! Manufactured from high-strength 7075-T6 forged aluminum and MIL-STD hard coat anodized for extra strength and durability. Precision machining ensures drop-in installation of all mil-spec components! Marked Multi-Cal. The Spike's Tactical PHU Joker lower is a special series lower featuring a Joker logo instead of the usual ST Spider logo. Now features unique selector markings! Manufactured from high-strength 7075-T6 forged aluminum and MIL-STD hard coat anodized for extra strength and durability. Precision machining ensures drop-in installation of all mil-spec components! Marked Multi-Cal. The Spike's Tactical Crusader lower is a special series lower featuring a Crusader logo instead of the usual ST Spider logo. Now features unique selector markings! Manufactured from high-strength 7075-T6 forged aluminum and MIL-STD hard coat anodized for extra strength and durability. Precision machining ensures drop-in installation of all mil-spec components! Marked Multi-Cal. The Spike's Tactical Viking lower is a special series lower featuring a Viking logo instead of the usual ST Spider logo. Now features unique Old Norse/English selector markings! Manufactured from high-strength 7075-T6 forged aluminum and MIL-STD hard coat anodized for extra strength and durability. Precision machining ensures drop-in installation of all mil-spec components! Marked Multi-Cal. The Spike's Tactical Skeleton Viking Lower is a special series lower featuring a Viking logo instead of the usual ST Spider logo. Now features unique selector markings! Manufactured from high-strength 7075-T6 forged aluminum and MIL-STD hard coat anodized for extra strength and durability. Precision machining ensures drop-in installation of all mil-spec components! Marked Multi-Cal. The Spike's Tactical Waterboarding instructorLower is a special series lower featuring a waterboarding logo instead of the usual ST Spider logo. Now features unique selector markings! Manufactured from high-strength 7075-T6 forged aluminum and MIL-STD hard coat anodized for extra strength and durability. Precision machining ensures drop-in installation of all mil-spec components! Marked Multi-Cal. JP Enterprises JP-15 forged lower receiver with JP Original Fire Control Package installed by JP at the factory. JP Fire Control Package includes 3-3.5 lb trigger pull with yellow hammer and yellow trigger spring, Speed hammer, disconnector and over-sized anti-walk pins installed. JP Trigger Module.